There are many different treatment options for prostate cancer offered by Orange County CyberKnife and Radiation Oncology Center. They can vary depending on the age and medical history of the patient, the size of the tumor and its stage. However, radiation treatment with the CyberKnife Robotic Radiosurgery System is one of the most effective treatment options for prostate cancer. It can be used alone and in conjunction with other treatment options such as surgery and chemotherapy. CyberKnife is a non-surgical, pain-free radiosurgery treatment that delivers high doses of radiation directly to the cancerous cells, limiting harm to nearby tissue, nerves, and organs. Its extreme precision is particularly effective for reaching cancerous tumors in and around the prostate because its imaging system is able to monitor the smallest movement of the tumor and focus the radiation to the optimal location, even as that tumor moves naturally. Not only does this help kill the cancerous cells, it significantly reduces any side effects of the radiation therapy. And, the cancer specialists at Orange County are expert in using the CyberKnife for optimum results. One of the major obstacles to treating prostate cancer is the fact that the tumors in and around the prostate can involuntarily and unpredictably move throughout treatment as much as 5 mm in as little as 30 seconds. These movements can be due to natural occurrences such as the bladder filling and gas in the bowel. The CyberKnife hurdles these obstacles. The CyberKnife System works by combining a robotic arm with an imaging system. The robotic arm is flexible and moves around the body ensuring precision by reaching your tumor at hundreds of different angles with its beams of high-dose radiation. The imaging system tracks your tumor during the entire treatment process and sends the information to the robotic arm to guide its every movement. 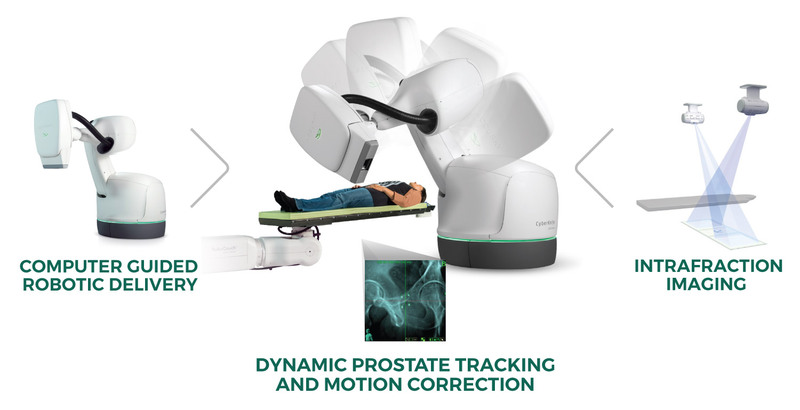 With this range of motion, the CyberKnife System is able to avoid healthy tissue and form its emitted radiation to the exact shape of the patient’s prostate tumor. This advanced stereotactic radiosurgery system is the most precise available. Instead of surgery, or targeting general regions with large doses of radiation, we are able to use pin-point accuracy within the thickness of a dime. CyberKnife also provides treatment without invasive surgery, within a week’s time and with minimal side effects. Our Orange County radiation oncology experts can work closely with your medical team to use the CyberKnife system for stand alone treatment as well as for treatment that complements other treatment options including surgery and/or chemotherapy. During your initial treatment visits, one of our board-certified radiation oncologists will work with your medical team to evaluate existing data such as your PSA, Gleason score, biopsy results, imaging and other information. During the Pre-treatment phase, usually two weeks before beginning treatment, a urologist will implant three to four markers, or fiducials, into your prostate. These markers will help doctors track the exact location of your tumor during treatment. You will also have a CT scan and an MRI which will generate a detailed image of your tumor. Orange County CyberKnife’s board-certified radiation oncologists will then prepare a treatment plan that will give you the best possible outcomes for your prostate cancer and program it into the CyberKnife System. About a week after the imaging and dose planning, you will begin treatment at our Southern California office. When you arrive for treatment, you will be asked to relax on our comfortable treatment couch, listening to your favorite music, if you like, while the CyberKnife’s robotic arm moves around you delivering high doses of radiation from multiple angles and tracking the tumor’s subtle movements to maximize precision and accuracy. No anesthesia is required for radiation treatments. Unlike traditional radiation treatment types which can last for weeks, CyberKnife treatment is completed in four or five sessions, one short treatment per day, over the course of one to two weeks. Contact Orange County CyberKnife for your Prostate Cancer Options Today! If you or a loved one has been diagnosed with prostate cancer, it is important to begin treatment as quickly as possible. Give our radiation experts a call today at (714) 962-7100 and discuss with them your specific case and the options that are available to you. They will answer all your questions and make sure you understand how CyberKnife can effectively treat your prostate cancer. Your first phone consultation is always free. Or, reach out to us using our online appointment form to ask your questions or schedule your appointment. We look forward to hearing from you and caring for you soon.